In the current economic climate it is vital to keep on top of finances but even with the help of Financial Advisers, it can be difficult for the average person to develop understanding on how any financial assets fit together and what the data actually means for them. Coyle Asset Management, based in Glenview, Il, has provided financial counsel to families since 1972. Their team of 17 professionals helps families achieve their priorities and to navigate changes and transitions in their lives. Their offering is quite distinct in the Financial Services arena, they aim to help families become educated themselves and gain perspective on their finances with many clients expressing that Coyle’s services have helped them connect their finances with their personal and family lives for the first time. They have used MindGenius for 4 years within their firm, with their financial planning clients & their back office staff for working out processes and working on projects. Gary Klaben, Financial Advisor/Owner of Coyle believes MindGenius helps set Coyle apart from other Financial planning offerings and they always get a “wow” response from their clients when they use MindGenius to show the overall structure of a client's family & wealth estate. The map format allows them to tangibly illustrate various finance, estate, tax, legal, accounting, real estate & other financial areas in an easy to understand format. Fig 1 - Section of sample Financial Planning map. The key benefits of working this way are it’s easy for clients to understand their financial information and it’s also easy for other advisors/ and others involved in managing the information to understand the complexity, how it’s all connected, and who's involved. Clients are also given a printed map to take home with them so they can keep a record of their information for reference in a format that is clear and logical. Their belief in MindGenius is so strong, that they became MindGenius affiliates 9 months ago and have made a success of this through promoting MindGenius to their clients via their intellectual capital company, Protinus. Protinus clients are financial advisors who do the same activities & provide similar services as Coyle Asset Management. They go to Coyle for training which takes the form of a one day workshop and teaches the “Mind Map Illustrator™” process with the ultimate goal being for the attendees to be able to apply what they have learned. 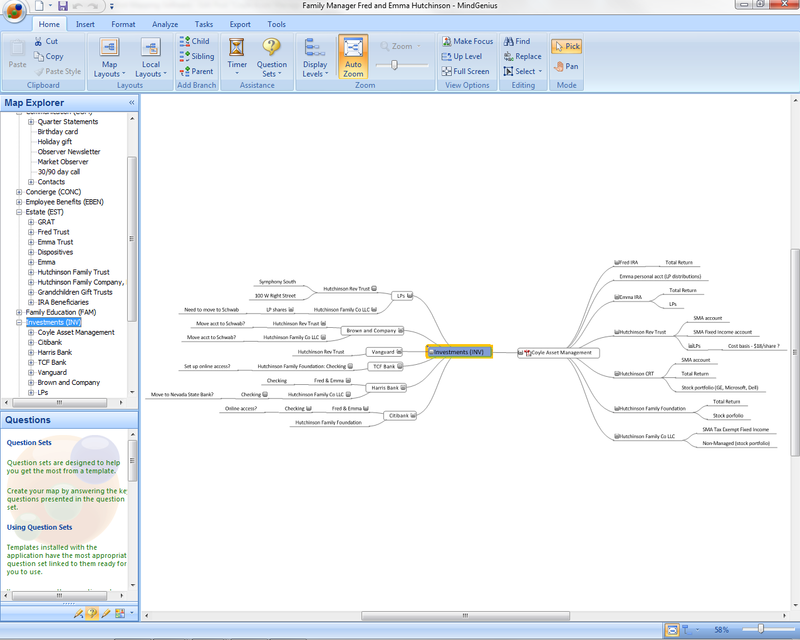 The Mind Map Illustrator™ is a process by which greater value is delivered to their clients through clearer communication and enhanced capabilities. Attendees are given a road map to assist them with implementing the plan to reinvent their firm and obstacles to changing to this new process are quickly eliminated as their colleagues quickly see the benefits the technique can bring. Workshop participants receive hands on practical experience which help achieve these goals and implement the Mind Map Illustrator™ process as soon as they return to the office. The response has been impressive with much positive feedback. In one workshop, using mind maps as a review of a client case, Coyle discovered a major error on a client’s beneficiary designation that otherwise would not have been caught. Traditionally, they would have used the Microsoft suite of tools, portfolio software, financial planning software or investment management software, combined with many different printouts of these to explain a client's account. Not only was this more time consuming to produce, the format wasn’t as easy to understand. The mind map allows the client to see the associations and once you have associations then you have connections and once you have connections then you have memory. “MindGenius has enabled us to provide a new level of clarity for clients, clients can now see all of their financial assets by looking at their individual Master Map we create. This process has also helped our back office to organize all of the relevant information & to process it. Have you used MindGenius for financial planning? How have you found it? The MindGenius free map viewer now includes the facility to view Gantt charts created within MindGenius. 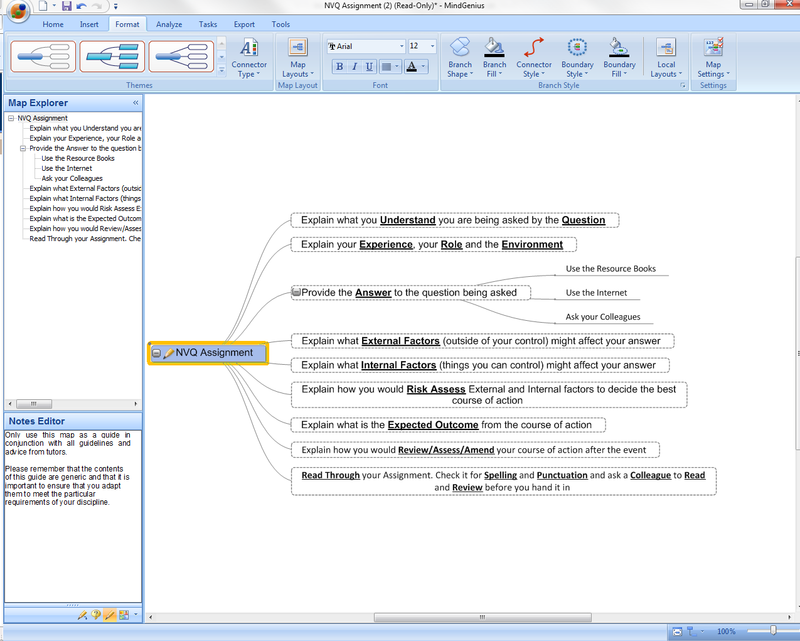 The MindGenius viewer allows you to distribute your map and Gantt files in their original format to colleagues who do not have access to MindGenius. As well as allowing colleagues to view your maps, the map viewer also allows them to add Notes to branches on your map, when in the map view, enabling them to review maps and add comments and feedback to your ideas before sending it back to you. While the 30 day trial version of MindGenius does turn into a viewer after 30 days, it does not offer the capability to add branch notes and the map viewer file is also far more compact and faster to download. This month's hints and tips are in a slightly different format. 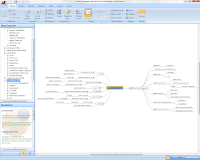 We have put together a video on using the Analysis and Categories features in MindGenius. When we are initially gathering information into our map, MindGenius lends itself to not having to worry about order, logic or structure. By introducing categories into our map we are able to revisit our unstructured data and apply logic that can then be filtered and understood. Adding categories to your ideas is also a good way to break down and make sense of your information and helps you to get the clarity required to make further progress. It's a useful feature in both business and education. In business, it is a vital part of analysing information captured in a brainstorming, it can also be used to group similar ideas eg in a large project, or to re-group and focus in on ideas that are linked. In education it can be used to make sense of information captured during a class discussion, and to mark similar topics in studying. Are there any other videos on functionality you would like to see? Project planning is a constant challenge for many of us in our day-to-day business lives. From the initial project planning stages, through keeping on top of the details to delivery, it needs focus to ensure effective project delivery. Sharp Software Services is one organization who are finding that MindGenius can help them to do just this, particularly since the introduction of the integrated Gantt view. Sharp Software Services help their clients to save money, increase profit, become more efficient, and help them get the correct IT from the best suppliers. They have been in business since 1981, with many clients, ranging from Investment Banks in London, Paris and Zurich, to local businesses. Roy Sharp, Partner at Sharp Software thinks that MindGenius mind mapping software has speeded up the project planning stages, as well as ensuring that they don’t miss any steps in this initial, vital stage. They utilize MindGenius for daily job tracking with every client. Firstly they create an overall map that contains current activities and their status ie whether or not it’s active / on hold, along with the % complete. They also create a map for each client that outlines the fine detail of future activities, making use of filtering to focus in and only view selected data such as activities that are incomplete, essential or optional, or by implementation group. A map is also produced per project as a pre-cursor to a project plan, to establish all of the activities required to complete the project effectively and the critical path. This helps to ensure a comprehensive project plan is created, and everyone understands the scope and timescales. Since the introduction of the integrated Gantt view in 3.5, they have used it on projects, including a recent one with a small business to upgrade hardware, implement new software, and modify some of the business processes at the same time as moving office. Using the Gantt view meant that the project plan didn’t have to be exported out to another application such as MS Project and allowed them to discuss flow and dependencies easily. When undertaking a course or a qualification, whether you are still in education, or are doing professional training in your workplace, it can be difficult to know where to start with course work, or studying, and many people may rush into this without any formal planning, meaning their attempts take them longer, or may not be as good as they could be. One organization who is making use of MindGenius to help with this is St Omer Residential Home. St Omer is based in Torquay, Devon and was established as a Care Home in 1983. Care Homes have many strict rules they need to adhere to when it comes to looking after their residents and their staff must be up-to-date with all of the latest best practice and training. Their staff have been using MindGenius for planning their course work, to study, and more specifically for their assignments for their National Vocational Qualifications (NVQ's) in Health and Social Care and Management. Ian Day, the owner of St Omer, believes MindGenius has helped increase the staff’s chances of succeeding with their NVQ’s, as it helps them to focus on their ideas, with no need to worry about adding order to them. After all of their ideas are captured, they can then manage them and add any necessary structure. When the team first started using MindGenius, they looked at the in-built templates to understand how it could be applied and help them, but they have since developed their own in-house template style which works for their staff, for some of whom English is a second language. Using their own templates has also enabled the staff to re-use and edit existing maps with no need to recreate work from scratch. One such personalized template they have come up with, ensures there is clear instruction for staff on what they need to do and covers subjects such as what people understand from the question, prompts them to explain their experience, role and the environment, and explain external and internal factors that might affect their answers. Using the template, ensures all staff members have the best possible chance at succeeding with their NVQ’s and are less likely to miss something important in their answers. Have you used MindGenius for anything similar? Just a quick reminder - our 20% discount on the usual price of £500* for a primary school and £1295* for a secondary school site license is due to expire on July 31st 2010. This offer is also valid on University site licenses and via EDUSERV. Contact us at info@mindgenius.com to find out more information on pricing or to purchase. Following the release of MindGenius 3.6, MindGenius Enterprise customers should contact info@mindgenius.com to request the download link for the latest version. There is no need to uninstall earlier versions of MindGenius 3 and the product will still be activated. 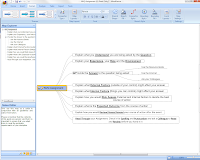 As well as routine maintenance work, MindGenius Version 3.6 includes functional updates to the Gantt View and the addition of a file convertor which allows users to import data from Mind Manager and OPML formats. Please note: all Enterprise users should not download via any other link on our website – this will overwrite their installed Enterprise version and they will not be able to activate this new copy.